“Frame #17, Southwest, Bold, Sm.” is embossed in gold on olive green card stock and the inside is cut out. 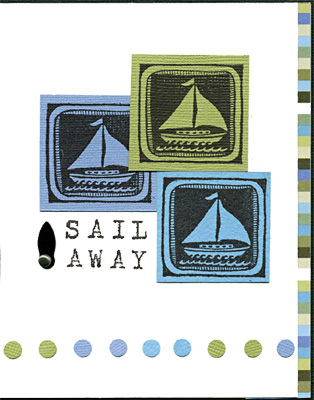 This is layered as shown using cranberry, gold and tan card stock. “Doe by Branches” and “Distant Birds” are stamped with a black Memories pad on white card stock and colored with chalk and pencils. Card by Danielle Côté. 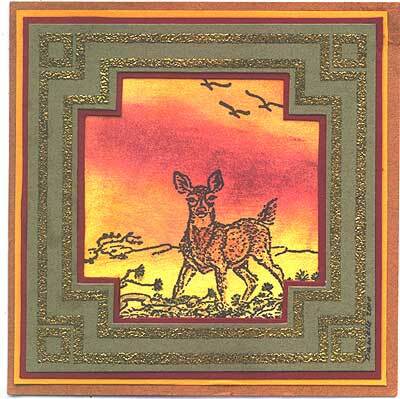 Tags: Chalks, Colored pencils, Danielle Côté, Distant Birds, Doe by Branches, Embossed, Frame #17 Southwest Bold Sm. “Rose Fan, Lg.” is embossed in black on Oriental lettered vellum with the printed side down so as to give a muted look behind the fan. 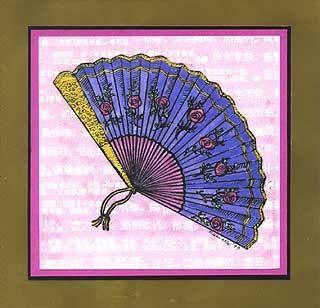 The fan is then colored with pearlescent and acrylic metallic inks. 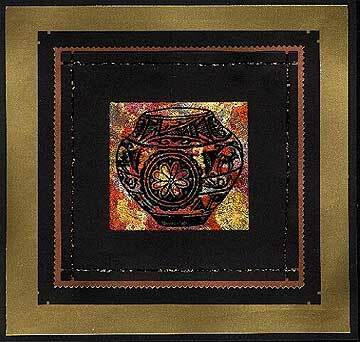 The vellum is layered over rose, black and gold card stock. Card by Danielle Côté. “Zuni Pot. 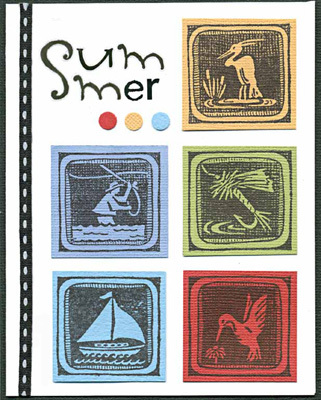 Lg.” was stamped with a black memories pad on multicolored “Leaf” which had been applied to a square piece of card stock . That was then layered onto black card stock which was layered on copper card stock which had been trimmed with decorative scissors and layered on another piece of black card stock. The final layer is gold card stock. A border made with fine metallic cord has been formed on one of the black layers. 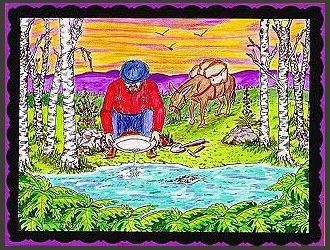 Card by Danielle Côté. Tags: Cord, Danielle Côté, Decorative Scissors, Leaf, Zuni Pot Lg. 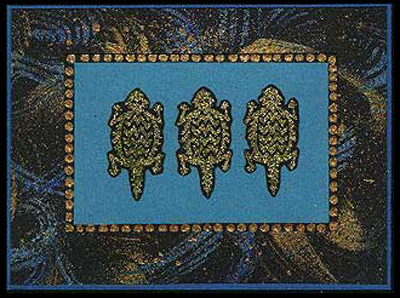 “Mimbreno Horned Toad” is stamped three times, embossed in gold on black card stock , cut out and layered on turquoise paper which has been layered on black card stock with gold embossed dots bordering it. This is then layered onto background paper. The final layer is dark blue card stock. Card by Danielle Côté. 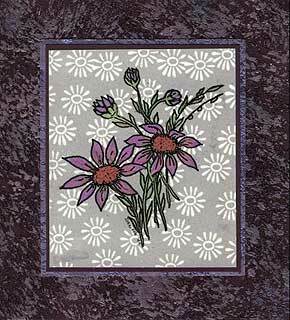 “Bouquet, Lg.” is embossed in black on front of vellum and colored on the front with LePlume markers while “Sunburst, Sm.” is embossed in white on the back of the vellum. This is placed behind a frame made of three layers of background paper. Card by Danielle Côté. 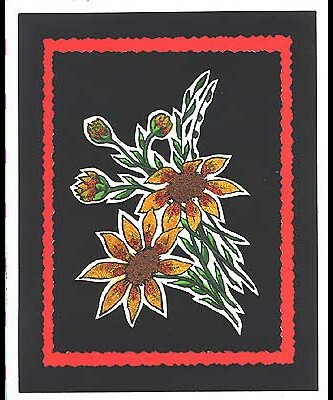 “Bouquet, Lg.” is stamped in black memories on white card stock and colored with markers. Glitter is applied to the flower petals and brown puff embossing powder to the center of the large daisies. The bouquet is cut out leaving a closely trimmed border around it and is layered four times onto black glossy, orange, black and then white card stock. The card and the first layer are trimmed with deckle scissors. Card by Danielle Côté.